Not a moment too soon for some, the Babe Zaharias entry forms are now available! We look forward to seeing many familiar faces and some new ones at this year’s event at Luffness. Full details of the clubhouse facilities and catering will be posted on our website before the event. Catering will be available for most of the day including the evening. Those wishing to dine in the evening will be asked to book in advance. The annual match between the East and West teams for the Mhairi Mac Kay Trophy took place yesterday at a rather cold and misty Baberton. The girls were all very grateful for their smart new red team jackets which I am told were quite cosy. West won the closely fought match which ended with an East 3.5 – West 4.5 scoreline. Ala at the end of the field had a convincing 4&2 win. Round 2 of the Summer Hole & Hole has now been completed. The third round is due to be played on or before the 24th June. Let us hope for some warmer conditions for this round. Following a late withdrawal for family reasons 41 pairs had a fun day a Winterfield. It may have been cold outside but the welcome inside was definitely warm. Most people also stayed on to enjoy the excellent food. There were some great results and some not so great but the course was looking good. The top four pairs from today’s competition qualify for the Scottish Final at Stirling GC on Monday 3 September 2018. Thank goodness that a let up in our Arctic weather conditions has meant that many of the second round ties have now been completed. A gentle reminder that the deadline for the completion of this round is Sunday the 27th of May. Please note that the tee of times have been changed to 10 minute intervals so your tee off time may be different from the time you booked on line. Please check the draw sheet for your new time. Most of the team names will be familiar to you having played in the team before. The new “caps” are Annabel who is in her last year as a junior and has played in the Cuthbertson team for the last 3 years and has played in the East of Scotland Girls and Kay Lannin who has been in the squad for a number of year’s but unavailable for the Jamboree but has just retired. Many will remember her 21 hole battle with Jill in the final of last year’s Championship at Muirfield. We are all very excited about the East Division County Championships, to give them their full name, are being held at this year on our home ground. We hope that we will get some of this great weather for the event and that lots of you will come down to Dunbar to support the team. So put the dates in your diary, 25th – 27th June. The format is morning foursomes and afternoon singles. The full draws will be posted on the website nearer the date. Four of our younger players are currently studying in the USA and we get asked from time to time as to where they are and what they are doing. Clara Young is at Missouri University and has been a regular member to the Mizzou team – The Tigers – throughout her time there and has contributed to many successful results. The team as a whole finished the year on a high with their best finish in the NCAA Regional finals since 2005 although Clara did not score as well as she would have liked. 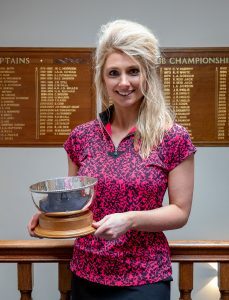 She will be home shortly to take part in the Scottish Women’s Amateur Championships at Elie and will be keen to try and win the trophy for a second time having been pipped at the post last year. Lesley Atkins completed her undergraduate degree last year and has been studying for her Masters at Lenoir-Rhyne University in Tennessee and working her passage as an graduate assistant to the University’s golf teams (The Bears). The ladies team in particular has done well this year. Joanne Free is at Minnesota University and has had a great time in her freshman year and a regular player in the The Gophers team. Joanne reported some of her experiences in an email to us that was read out at the AGM. Joanne returns next week and will no doubt have many more tales to tell and will also be looking forward to real links golf. Joanne will also be heading to Elie for the Scottish. Lauren Lee is also enjoying her freshman year at the University of North West Ohio. Indeed she is enjoying the States so much that she opted to stay and do summer camp in Philadelphia this summer rather than come back to sunny Scotland. With a very strong first team this past year (winning their first ever WHAC Championship) Lauren has played mainly for the 2nd team. 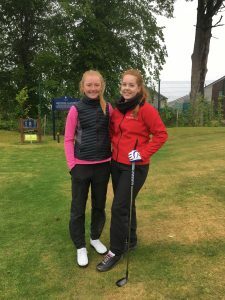 Back home Annabel Hosie in her final year as a junior has been selected again to play for the East of Scotland Girls and will be teeing up in the East v West Match at Baberton on the 27th May. Well done to all our “girls”. A selection of photos from the final day of the championship mainly taken in the morning before the afternoon rain set in and everyone disappeared under waterproofs, woolly and waterproof hats, and umbrellas. We returned to Gullane this morning for the semi-finals of the championship and the final of the Handicap Quaich. There was a bit of a breeze but glorious sunshine. Cut off trousers polo shirts and sun visors were the order of the day. In the first match out defending Champion Jill McNicoll played past Captain Barbara Biggart. Jill edged ahead at the 7th and made steady progress to find herself 4 up at the 15th. A strong comeback from Barbara however took the game to the 18th where Jill closed off the game 1 up. The second match was between newcomers to the County both playing in their first East Lothian Championship. Audrey Dunnett won out eventually over Karen Fullerton at the 17th 3&1. Karen found a few too many bunkers along the way but was delighted to have had the chance to play Gullane in such great conditions. The final match of the morning was the Handicap Quaich which was a long battle for both players against each other and the bunkers. 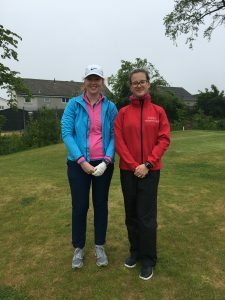 The lead swung back and forth between June Elliot and Lorna Thomson with neither player quite able to make more than a two hole lead before being pulled back to all square, which was the state of play at the 18th. Lorna played a great shot to the green from a fairway bunker only to see it kick into a green side bunker. A bunker too far in this case and June took the trophy for the first time. The conditions this afternoon were in complete contrast to the morning with heavy rain and wind for much of the round. Waterproofs were donned by most on the first tee for warmth as well as protection from the threatening rain. Audrey took the first hole and Jill the second followed by several halved matches before Jill started to edge slowly ahead and when Audrey got caught up in the wet rough on the long 15, Jill drove home her advantage hitting the green in regulation and a shake of the hands followed soon after. Jill retained her title with a 4&3 win. Audrey like Karen had greatly enjoyed the experience and we are sure that we will see both players returning to the fray in future Championships. Well done to our Champions Jill McNicoll and June Elliot. Thanks also to those who turned out to supports the players. The winner of the Handicap Quaich this year is June Elliot (The Glen). June beat Lorna Thomson (Gullane) at the 19th Hole. The final of the championship will be between Jill McNicoll (Gullane) and Audrey Dunnett (Royal Musselburgh). We were treated to some great golf and great weather for the first day of the 2018 Championships. In the morning matches Dawn Young raced off to a 7&5 win in the first match and further down the draw Anne Marshall had a surprise 4&2 win over last year’s runner up Kay Lannin, but five of the remaining matches in the Championship went to the 18th with the last match going to the 19th. In the Handicap Quaich the matches were hard fought but not so close. 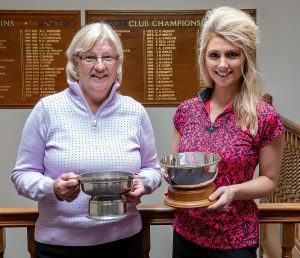 The last match between Jean McNeill and Morag Nicholson was notable for a hole in one from Morag at the 13th on her way to her first round win. Well done Morag. In the afternoon Matches our last two Captains went head to head in a close match that went all the way to the 19th before Barbars secured a place in the semi-finals. 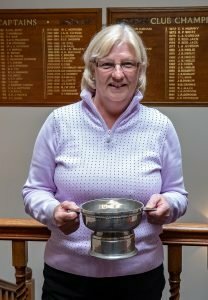 Last year’s winner Jill McNicoll had a decisive 5&3 win to secure her place and a match with Barbara. In the bottom half of the draw newcomers Audrey Dunnett played well to beat Hazel Suanders while Karen Fullerton who had earlier put out Sue Penman had a convincing win over Fiona MacIver. The two newcomers meet each other in the other semi final. 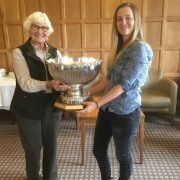 In the Handicap Quaich June Elliot who had earlier put out her fellow Glen member Linda Henderson now secured a place in he final with a win over Pat Phillips. Lorna Thomson meantime had a good match with Morag Nicholson winning out at the 16th 3&2. We look forward to watching more great golf in the sunshine tomorrow. The morning semi finals start at 9am and Handicap Quaich at 9.16. The Championship final starts at 2pm. Why not come along and watch? The trophies will be presented in the clubhouse following the final. Full results in earlier posts. The completed draw sheets will be provided on completion of the competitions. The results of the first round of the championship and the Handicap Quaich can be found by following these links. The highlight of today was a hole in one by Morag Nicolson.